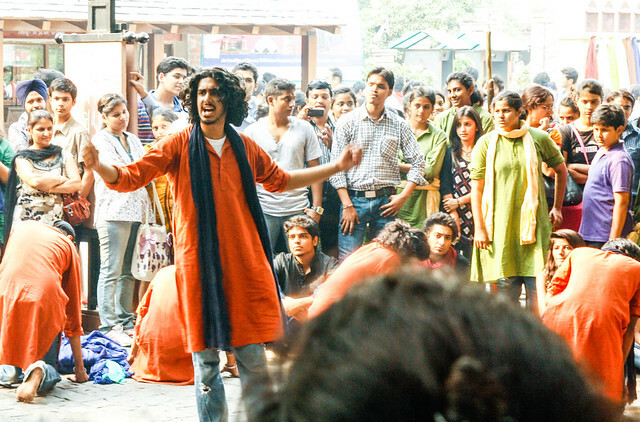 Indian theater is a vibrant, ancient cultural tradition, and street theater–dramatic plays performed by barefoot performers with minimal props on the streets of India–dates back to at least the 1960’s when activists happened upon it as a cheap, highly effective edu-tainment strategy to communicate various social justice and public health messages to a mostly illiterate audience. 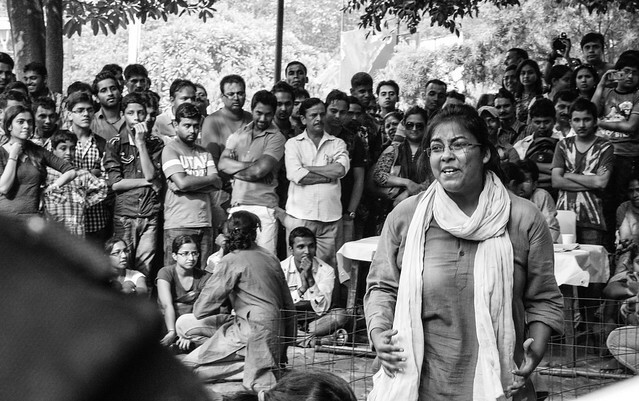 Many of the social entrepreneurs I used to work with back in my Ashoka days rely, at least in part, on street theater performances to convey messages about everything from family planning to environmental conservation to politics to women’s rights. It’s a homegrown strategy well-suited for India, where many people remain illiterate and everyone appreciates a certain amount of dramatic flair. 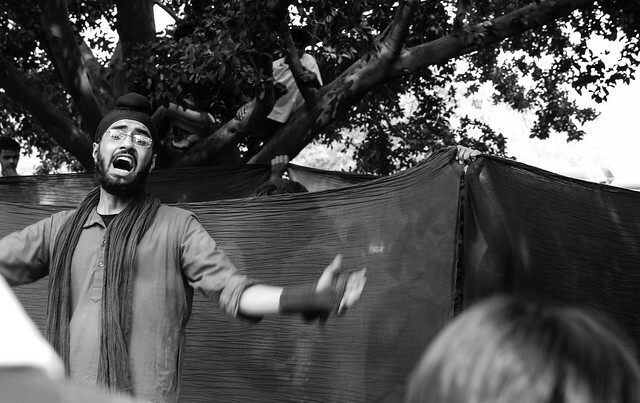 What I didn’t realize about street theater, and what I really should have known, is that colleges all over India produce street theater teams. 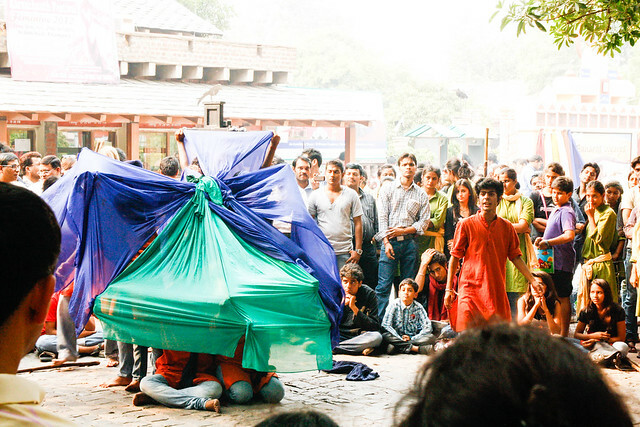 This is the country that has competition for everything from yoga to mud wrestling, so it should also go without saying that there are competitions for street theater as well. Sunday afternoon, in a quest to get out and do something between nap and dinnertime, my husband suggested we check out Dillihaat, across from INA market. 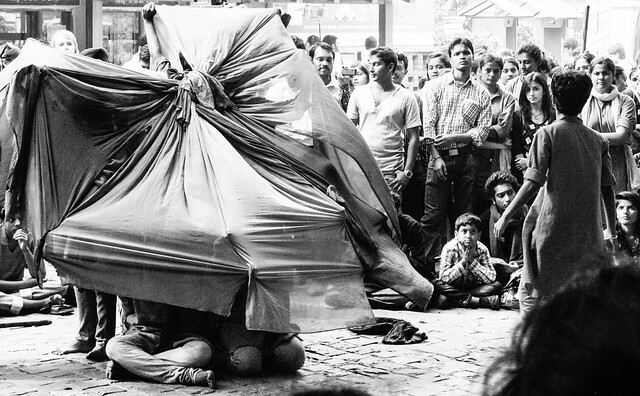 For 20 rupees you can enter this government textile-industry-sponsored simulation of a old-fashioned bazaar to barter over touristy and/or cheap scarves, bed covers, blankets and clothes in styles and fabrics representing nearly every province of India. It’s a bit gimmicky but it remains a popular destination for both tourists and middle-class Indians alike. Plus, the food court is not half bad. 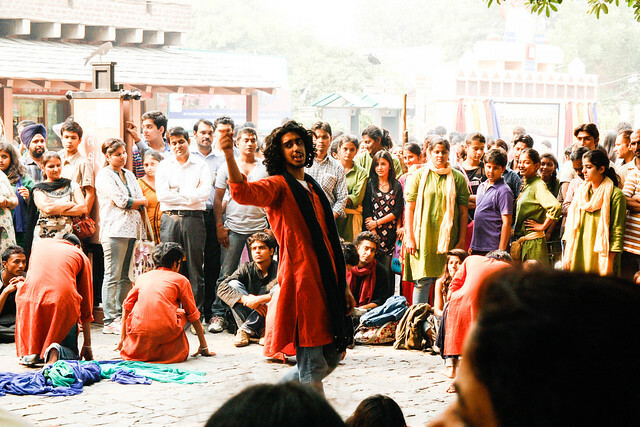 The open public space in front of Dillihaat hosts a bunch of cultural performances through out the year which was where we, luckily enough, stumbled into the audience of an extraordinary competition for university street theater teams–25 of them from all around Delhi. 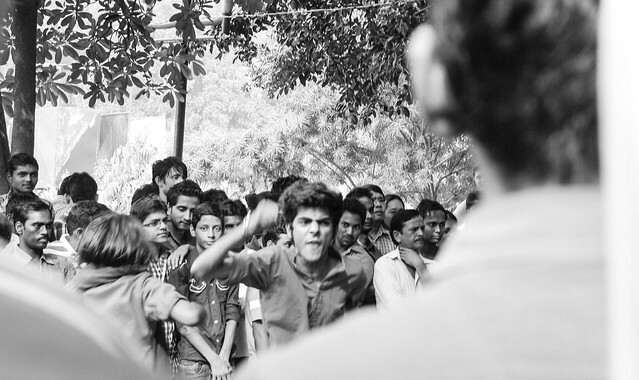 We walked into a crowd standing in a circle around a group of young people shouting and screaming and chanting, wearing theatrically exaggerated expressions of anger and fear as they danced and moved around the circle to the beat of a loud drum. 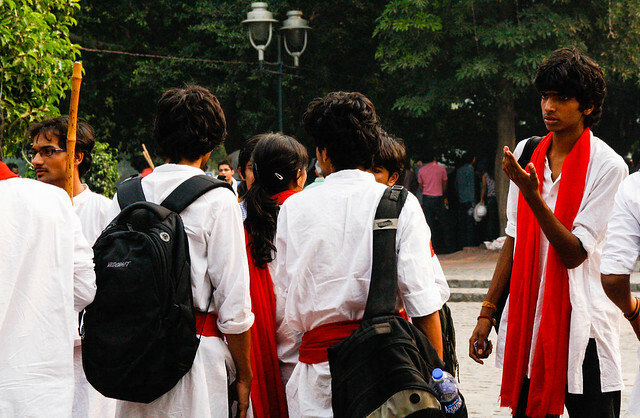 Each team wore nearly identical khadi-style cotton kurtas and coordinating stoles, over their jeans or leggings–one color for each team. They all took turns huddling just outside the performance areas in front of the judges’ tables, talking strategy and running through their routines. 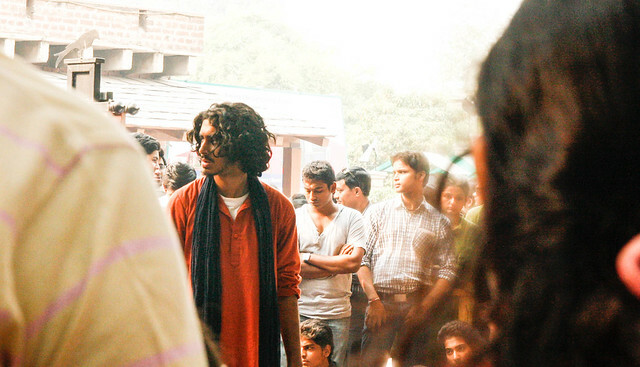 Then, one by one, they slipped off their shoes, took their places in the circle and transformed from normal Indian teenagers into fiery, shocking and intense performers. I ran around on tip-toe trying to see over shoulders and asked a few of the bystanders and performers what was going on. As far as I could find out, each group performed a sort of morality play of their own. At the end of the night, the winners would be announced and the top four teams would move on to an India-wide competition in Mumbai. It was fantastic. The energy, the expressions. 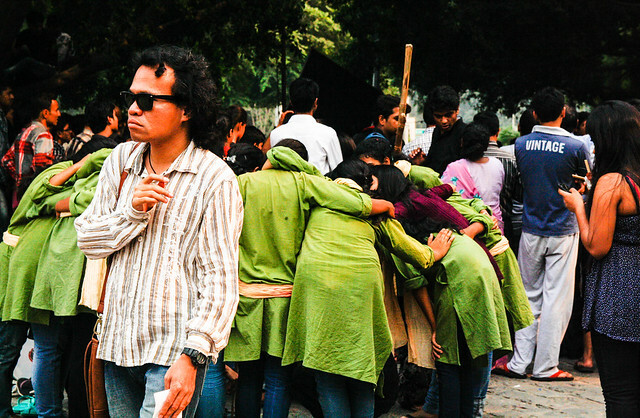 I love this about India–there is no end here the expressions of culture. Some people might do yoga or insane acrobatic maneuvers on top of giant skinny poles, while others theatrically leap and cower and chant their way across hard stone pavers to tell a story. 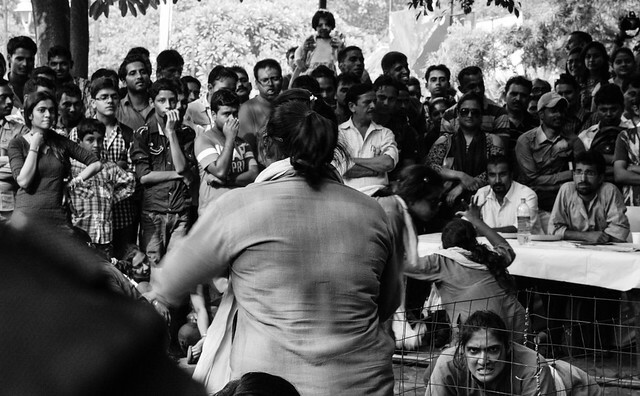 I didn’t manage to get the best sample of the plays, but here is a small video taste from a down-tempo moment in a performance by a women’s college from around Delhi. A note on the photos: this was a new challenge for me trying to shoot from a distance over the crowd without knowing exactly what was going to happen next at any time. One of those days where I really felt the limits of my ISO again as I jacked up both the shutter speed and the focal distance in order to capture the action as clearly as I go. Next time I think I’ll open up the aperture more and just hope for the best, though I am glad-in this case-to have been able to capture so many expressions from the crowds in the background! Great photos! I like that you were able to capture not only the performers, but the audience as well. These photos are beautiful! Street photos are the hardest thing, especially in broad daylight when you have all those crazy shadows going on (not that it’s any easier at night, duh). I’m all for manual settings, but in some instances I’m definitely prone to just switch my camera over to the sports photo mode, which is somewhat embarrassing for some reason? Anyway, what sort of lens are you using, again? I always shoot in manual becuase that’s what I’m most used to but I should have totally turned on the sports setting! Arghh one of those beginner “duh” moments for me I guess! The lens I was using was my Sigma 17-50–although since I’m shooting on the Rebel I guess it’s not a true 17-50 but it’s still a great, great lens. I don’t remember the last time I took it off now!